Northside Rotary Member, Hugh Hanes discusses the benefits of Early Act First Knight program in the July 10th edition of The Victoria Advocate. What do Victoria Independent School District and Rotary have in common? They both work with school kids in teaching virtues of compassion, discipline, honesty, respect, service, confidence, friendliness, perseverance, responsibility and tolerance. 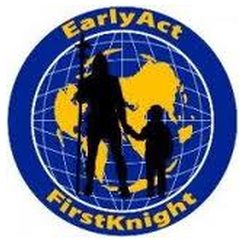 Have you heard of the Early Act/First Knight program? This next school year the EAFK program will be in thirteen elementary schools in VISD. What is Early Act/FirstKnight? Created by Dr. Randall Parr's Knights of The Guild, EarlyAct/FirstKnight is a curriculum-based character education program for elementary and middle schools. Themed around gallant knights and Rotary's Four Way Test, this proprietary program is sponsored by Rotary Clubs for local campuses and teaches students how to become noble, service-oriented people, along with why it is important for them to do so. This unique program combines several integrated elements that make it effective: excellent academics, live campus action, cool rewards, Rotarian mentorship and adult education. To learn more, please visit their Website at www.eafk.org. The EAFK program is based on the Rotary Four-Way Test of the things we think, say or do:• Is it the truth? Herb Taylor, author of the Four Way Test, said, "I believe that the great opportunity and the great responsibility of Rotary rests in the field of building character, in the building of men." The students know and say the Rotary Four-Way Test every day. The EAFK program kicks off each school year with a tournament that is held at the Victoria Community Center. The kids get to see and hear knights in shining armor riding magnificent horses and teaching virtues and valor that they will learn and use forever. Then during the school year, each campus has six knighting ceremonies. Each ceremony has one or two of the virtues as its focus. Each classroom teacher selects one student who best exemplifies the selected virtues. The students are not told of the teachers' selections. The students' parents are invited to attend the knighting ceremony, but they do not let their student know of the award. The day of the ceremony is exciting for everyone. A Rotarian shares a personal story based on the virtue(s) being awarded. The EAFK Knight shares a story that is relevant to the virtue(s). Teachers read the accolades of the students' accomplishments, and their name is then revealed to receive their medallion on stage. The student is surprised in receiving their award but also surprised as their family comes on stage for the presentation. Photos are taken with the knight, student and family. The students are then seated in the Gallery of Champions. The goals for the EAFK program are to teach students the virtues that are needed now and in their future. From a teacher's perspective, it would be to have a more productive classroom and safer school environment. The school district's view is to have students who live their lives with good ethics and morals which will be shared with others for years to come. Hugh Hanes is a retired Victoria business owner and member of Victoria Northside Rotary Club since 1989. He has been working with the EarlyAct/FirstKnight program for six years. He may be emailed at hhh317@nodial.net.